The second full month of Germany’s unrestricted U-boat war draws to a close. Holtzendorff, the German navy’s chief of staff, had predicted that if 600,000 tons of British shipping were sunk by the U-boats per month then after five months their total merchant fleet would be reduced by 39%. Facing starvation and financial ruin the British would then be forced to make peace. Allied shipping losses this month come to some 555,000 tons. This is short of Holtzendorff’s target but is still very impressive. Germany’s leaders hope that if maintained they will force Britain out of the war. With the recent revolution in Russia suggesting that its commitment to the war may now be wavering, it looks as though 1917 might well turn out to be the year of German victory. The Germans knew that their escalated U-boat campaign risked antagonising the Americans. To manage this threat, they have attempted to form an alliance with Mexico. Zimmermann, the German foreign minister, sent a telegram to the German ambassador there, instructing him to promise the Mexicans arms, money and US territory in the event of war with the United States. Unfortunately for Zimmermann, his telegram was intercepted by the British and decoded by their secret cryptography unit. Its public release has caused a sensation, hastening the Americans along the road to war. Zimmermann could perhaps have tried dissimulation, claiming that the telegram was a forgery, another plot by perfidious Albion. This seems not to have occurred to him. Having already admitted to the telegram’s authenticity to a US journalist, he now addresses the Reichstag to explain why he sent it. He claims that Americans should not be alarmed by the telegram’s contents, as he was merely seeking a defensive alliance with the Mexicans. Zimmermann’s speech does not go down well with the Americans. But it also plays badly in Germany. The public have been led to expect that victory is just round the corner thanks to the U-boat war. If so, why is the government trying to recruit Mexico as an ally? And given that Mexico is in the grip of an intractable civil war, how much help could it give Germany against the United States? Meanwhile in Mexico, President Carranza wisely decides to keep the Germans at arm’s length. He does not want to be sucked into a war with the United States does all the fighting for Germany’s benefit. The revolution in Russia has unleashed forces long bottled up by the Tsarist autocracy. The various non-Russian nationalities in the empire are now clamouring for a greater say in the government of their affairs together with more recognition for their language and cultural rights. But the Provisional Government is wary of offering too many concessions to the various minorities. They fear that this run the risk of encouraging centrifugal forces that will break up the country. There is one exception to the Provisional Government’s cold shouldering of nationalism. Today they declare their support for Polish independence. But Polish independence is an easy promise to make. Most of Poland has been overrun by Germany and Austria-Hungary and is unlikely to ever be recovered by Russia. The Provisional Government hopes that by offering Poland its independence the Poles can be encouraged to fight against their Teutonic occupiers. Poland remains an exception. The Provisional Government is determined to hold the line against demands by other nationalists. In particular there are to be no concessions to nationalist sentiment in Finland or Ukraine. War weariness led to the recent revolution in Russia. However the country remains at war. The Provisional Government has promised to stick by Russia’s allies and to refrain from seeking a separate peace with the Central Powers. Milyukov, the foreign minister, sees no reason why Russia should not fight on to secure the gains promised in secret negotiations with the Allies, notably Constantinople. Outside the government, anti-war sentiment remains strong. Many heed the arguments of leftist radicals that the war is an imperialist one favouring no one but the rich and their imperialist interests. The Petrograd Soviet launches a peace campaign, renouncing the war aims of the pre-revolutionary regime and calling on the people of Europe to reject the imperialist war. For now at least the people of Europe show no sign of heeding the Soviet’s call. British forces have been hitting the Turks hard in Mesopotamia. Meanwhile in the Levant the British have also driven them out of the Sinai and are now at the gates of Palestine. 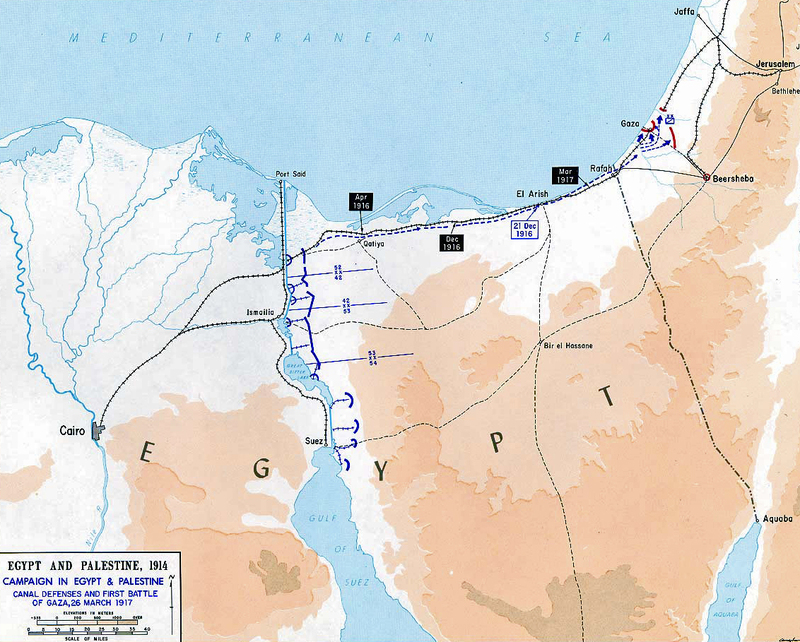 Now Murray, Britain’s commander in Egypt, sends his men to attack Gaza, strongly defended by the Turks, delegating command of the assault to Dobell, his subordinate. The British attack first with cavalry, surrounding the town. Then they begin to shell the town to destruction before the infantry move forward. The Turks do their best to hold back their attackers with snipers and machine guns but their situation becomes increasingly desperate. When Australian and New Zealand cavalry units attack Gaza from the north, the Turkish defence begins to collapse. The town’s surrender seems imminent. But then the unthinkable happens. Dobell orders his men to withdraw from their positions around Gaza. Communications have broken down and he is unaware of how close to victory his men are. Instead he fears that night will fall and leave them in an exposed position, short of water and ammunition, vulnerable to attack by any Turkish forces coming to the aid of those in Gaza. So he orders them to withdraw to safety. The Turks are astonished to see the British pulling back, but they quickly take advantage of the situation to launch some determined counterattacks. The British lick their wounds and prepare to attack again. In Russia the Provisional Government is struggling to contain the energies released by the recent revolution. Workers have been emboldened by the overthrow of the Tsar, leading to ongoing workplace militancy. Following negotiations brokered by the government, factory owners in Petrograd now agree with the city’s Soviet to accept the principle of an eight-hour working day, hoping thereby to avoid further industrial unrest. The eight-hour day now begins to spread from Petrograd to the rest of the country. The deal also includes the creation of forums comprising workers and managers in many factories, at which grievances can be discussed and hopefully resolved before they lead to strikes. The Provisional Government has brokered these agreements in the hope of keeping the factories open to maintain production for the war effort. Its commitment to the war provides some reassurance to Russia’s allies, who today formally recognise the new regime in Russia. Some in Britain and France view the revolution as a positive development: the advent of a liberal government in Petrograd makes it easier to present the war as one of democracies against dictatorial empires. But some are more pessimistic, noting that war weariness was a significant factor leading to the revolt against the Tsar. They fear that anti-war sentiment will eventually overwhelm the Provisional Government, leading Russia into a separate peace with the Central Powers.